A heat transfer press designed for bench mounting, the Practix OK-150 double-acting, fully automatic, clam shell fusing press is convenient, reliable, and affordably priced for even smaller operations. However, even though this fusing press is competitively priced, Practix never sacrifices power and quality. 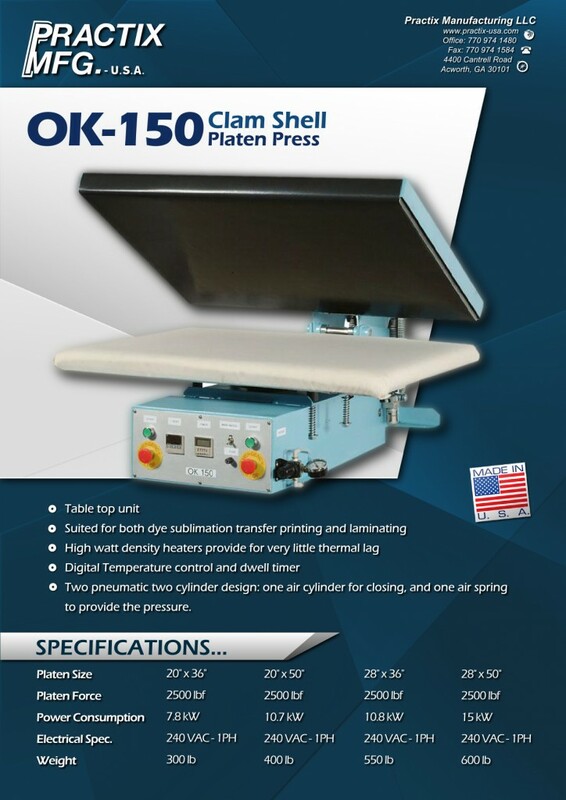 Like any Practix heat transfer press machine, the OK-150 is unitized to be compact and easy to use, and manufactured with a welded-steel frame for durability never before found in its price range. This quality heat transfer press also comes backed by one-year mechanical and electrical warranties. And all of our machinery is customizable to meet the exact size and color requirements of your facility. Whether you own an industrial print shop in Boston or a clothing factory in Cleveland, Practix has the industry-leading embossing, dye sublimation, laminating, and other heat transfer machines you need.